When you are starting to coupon it can be very helpful to learn the lingo or jargon of the couponing world. There are many sites and communities on the web for couponers and newbies to couponing can confused and overwhelmed with all the abbreviations and terms used by seasoned couponers. Since I have been couponing for 15 years now all of these abbreviations and such are like a second language to me. If I told you, “I went shopping at Wags this weekend and rolled my RR and used a peelie from a product and it became a MM!”, you might be lost and just give me a crazy look. So to help you be able to understand all of these strange abbreviations and terms here is a list of common ones you will find in the couponing world. BOGO/B1G1......stands for buy one get one...could be buy one get one free or buy one get one 50% off, etc. Cats....no not the animals. Those are the coupons that print up at the cash register. The machine that prints the coupons is called a Catalina machine, so naturally we shortened it to cats. DND....Stands for Do Not Double. You might see these on coupons, but some stores will double them anyways. Doubling....means the value of the coupon will double. Like a 50 cents coupon would double and you would get a total of a dollar off of the product/s on the coupon. EQ...electronic coupon, usually ones that you download onto your store's loyalty cards. Also known as digital coupons. ETS....excludes trial/ travel size. Means that the coupon can not be used on trial or travel size products. FARR....Free after Register Rewards (earned at Walgreen’s). You basically get the item for free. Like an item costs $4.50 and when you pay for it at the register you get a $4.50 Register Reward back to use on your next shopping trip. IP....Internet Printed coupons. Coupons that you print from the internet. MM...Money maker. Meaning that a deal that gains you money after the coupon/rebate offered. MQ...Manufacturer's coupon. Those are the coupons that are put out by the manufacturers. The coupon will usually have it stated on it if it is an manufacturer's coupon or store coupon. NED...No expiration date. The coupon/ deal does not have an expiration date. OAS....On Any Size, the coupon is good on any size of the product. OOP...Out of Pocket. How much you paid out of your pocket after all coupons, gift cards, etc. used. OYNO....On Your Next Order. Cats that print out stating “Save $2 off of your next shopping trip.” Usually earned when you buy a certain amount of items in one transaction. These are like coupon gold because you can use them on things like produce and meat! P&G...P&G Brandsaver coupon insert. Usually comes out the beginning of each month in the Sunday paper. Peelies...Coupons that are attached to the product. You have to peel it off of the product to use the coupon. POP...proof of purchase. The thing that the cashier scans to ring up your item. Usually needed for rebates. RP....Red Plum, a coupon insert that comes in the Sunday paper...or some get it in the mail during the week. Rolling....buying one item with a RR or ECB to earn more RR or ECB. SQ....Store coupon. A coupon that is put out by the store. SS...Smart Source, a coupon insert found in the Sunday paper. 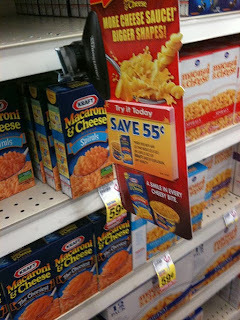 Stacking....being able to use a store coupon and a manufacturer's coupon on one product to get even more savings. Can be done at Target and Walgreen’s. TP....Tear pad. Usually a tear pad has coupons or a rebate that is found on the store shelves or display in the store with or near the product. Wine tags/ Hang tags....coupons that hang around the neck of a bottle/ top of a product. YMMV....Your Mileage Might Vary. Means what happens at that store might not be the same as the results in your area. With the aid of this list, you can now be able to understand more of what is being said by the seasoned couponers. Good luck and happy couponing! Kelli Ward is a married busy mom of 4, a nurse, and a loves to save money with coupons and bargain shopping! She has been using coupons for over 15 years and is sharing her couponing and money saving knowledge on her site, Savings Express.